lLeaders operate in a complex, competitive, and ever changing environment having to make choices in the midst of ambiguity. It can be a lonely job and often there is no precedence with nobody who can help resolve the dilemmas in a non-judgemental way. As coaches, we help leaders focus on the future, and arrive at decisions that achieve the balance between the short term needs and long term aspirations of the organization. We know that having set the direction, they need to mobilize individual commitment by translating future aspirations into the day to day behaviours and actions required of each employee. They also need to build organizational capability in terms of processes and procedures that allow change to happen. 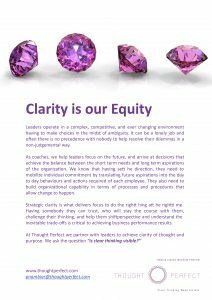 Strategic clarity is what delivers focus to do the right thing at the right time. Having somebody they can trust, who will stay the course with them, challenge their thinking, and help them shift perspective and understand the inevitable trade-offs is critical to achieving business performance results. I am ready, receptive, and grateful, and so it is.